The capital of the Islamic State in northern Syria has fallen to the Syrian Democratic Forces (SDF), a U.S.-backed militia. The conquest comes after months of relentless bombing and prep work by U.S. aircraft. The remaining ISIS fighters in Raqqa are hold up in a stadium that will soon be overrun. 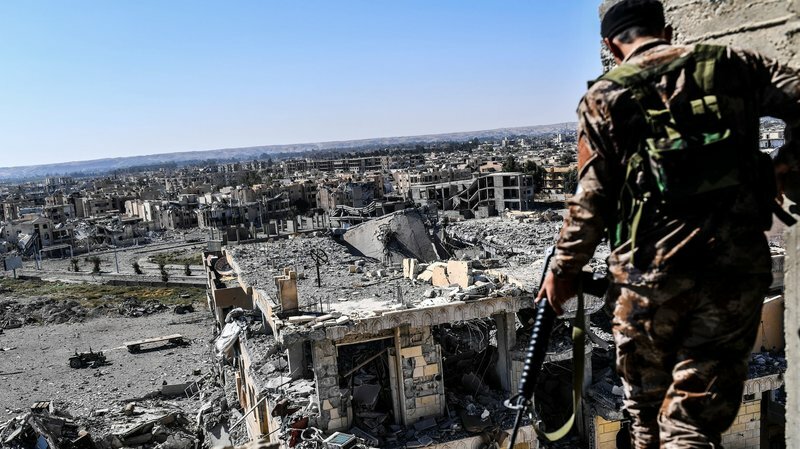 At its greatest extent the Islamic State controlled up to a third of Iraq and half of Syria, but the area of Syria and Iraq still under ISIS' control has shrunk substantially in the last few months, especially after Mosul was recaptured in July. ISIS territory is shown below in grey. Perhaps the most lasting effects of the nearly four-year-long conflict are the displacement of nearly all of Iraq's Christians and the establishment of a permanent presence of Iranian and Russian forces on Israel's northern border in preparation for Ezekiel 38. Fascinating! I reckon we'll all the truth in 17 days! Interesting. I've been thinking about Halloween and also the first few weeks of November, as well. Lot's of interesting connections and good timing. Are we still date setting? Have we not learned our lesson? We should now understand that the Body of Christ (Church) may not have any connections to the Jewish holy days, given the latest Fall Festival rapture guesses. Jesus does have a proven connection, as he was born a Jew, but Christians don’t (IMHO). Your picking a Thursday in early November may be as good of guess as me picking a Tuesday in late January. My point is that we don’t know. When the heavens open up and we hear a great trumpet, we will know the day and the hour. I feel it will be very soon, given the rebirth of Israel, but this date setting (“I’m not setting a date, I’m just pointing out…”) is getting old. For me, I’ll be watching and listening for His return giving the next day an equal chance for the Rapture to occur. The day I stop looking for the day (speculating that is) is the day Matt. 24:48-51, Heb. 10:25, 1 Thess. 5:4, and Rev. 3:3 disappear from my Bible. Also, the feasts are no Israel's, they are YHWH's. The Church is pretty intimately connected to Shavout, for example, imho. Will Jesus rapture the Church on a festival? Maybe, maybe not, but I would think it is just as misguided to say the rapture will definitely *not* happen on a festival as it is to say it definitely will. Not knowing the day or hour works both ways. Gary – I have not stopped anticipating the day as I don’t believe Jesus is delayed (I’m not beating my servants). I am meeting together and encouraging others. I believe the time is near and His arrival should not surprise me. I do find Unsealed very encouraging* because they present articles that show signs pointing to His arrival. We know the time (season) is near given the world events. However, I do believe that many have become discouraged with all the “it’s on this date… no, this date”. You may call it speculating but others see it as date setting. Some of our brothers and sisters may have given up hope with all the missed predictions. Where are all the “welp, I was wrong” fancy YouTube videos? If you’re going to list verses, let’s list those that warn about false prophets. * Hillary is a great addition to this site. Enjoyed her first message and look forward to more. That hurts a bit brother. What's a false prophet? Isn't it someone who claims to prophesy? Are all these dozens and dozens of Christians claiming to be prophets or claiming to prophesy? I know I'm not, nor have I ever. I'm big on owning up when wrong and I try to keep a sense of humility here, but I know, at least from my perspective, that we were always careful to say we don't know for sure. In pretty much every article on dates I've said that - going out of my way. I've done the same on all of our videos and The Sign page, too - even well before 9/23 rolled around. I've been privy to witness the exceptional increase in mission focus that occurs when we have something to look forward to (and we did, a HUGE sign in the sky). I'm talking people literally coming to faith for the first time or recommitting their lives to Christ. Maybe this is just my experience, but those holding too die-hard-ed-ly to "imminency" 1. miss some Scriptures that add to the big picture, and 2. have a much smaller sense of mission and true imminency then those who look for certain dates, but that's just my 2 cents. I mean this kindly, really, I just think there is a lot of borderline false accusation going on that doesn't need to be. Gary – no harm, I have thick skin. I agree that the large number of people accepting Christ in this season is a good thing. It’s a real good thing that in part came about from the Rev 12 sign. I’ve also read comments from those that are very discouraged that the date(s) came and went. I’m not pointing a finger at you at all. I’m talking about the YouTube guys that insinuate or claim that the Holy Spirit gave them insight, then point right at the date and say “how could this not be the day?”. The Holy Spirit does not give out bad information. Your posts, on the other hand, point to major events and give the reader a sense that we are leading up to something big. For example, the Fatah and Hamas post – something important which could very well lead to a peace deal with Israel (a very big sign!). Sorry if I came off wrong; keep up the good work. Hoping someone can answer a question of mine.....this barley delay talk that's been taking place. If it is in effect(the delay) and our calendar is off,so to speak, because of it...does this mean that we are technically now in the month of Elul? I appreciate any help! *If* the barley was not ready as expected then we would be in Elul now, with FOT in a few days I suppose. The problem is, I've yet to see a good argument that it was not ready. Thank you Gary and Mksmith. Never a dull moment around here. So much to continue to sift through. I have been unable to find suitable evidence re: the barley harvest not ready this past April...But is it also possible someone is hiding the evidence from those looking for it? BUT, I have viewed and listened to some YTVs showing how the sun and constellations are also off a month (via stellarium). Meaning, they are not where they should according to the Mazzaroth (i.e., God's timeclock). "Raise your hands if any of you brothers and sisters have felt a little odd about celebrating your actual birthday on any day other than the actual date of your birth. Now ask yourself how God may feel about His appointed times (Moedim) being observed on days that are not in sync, in alignment and agreement with His actual appointed times each and every year. Forget about the excuse that so many are using “how can we know which calendars that are being used are correct.” Only God’s calendar is correct and it is the one that resets and aligns all events for any and every given year. His requirements to know and understand the times and seasons each year can only be fulfilled by remaining focused on Him through keeping your eyes on His creation. The Rev 12:1-2 sign was absolute and beautiful indeed. The sign and the event are two different things. The sign points to the event. In this case, the sign points to Yom Teruah, the FoT, with a one lunar cycle advance notice (Oct 20-21) because the 7th month and first day (new moon) are now the 8th month and first day (new moon). How awesome is that? The sign gives us comfort and allows us to stay awake and vigilant giving us time to continue advancing God's kingdom and growing His family for an additional month. The barley needing another month and the leap year are one and the same for 2017. God required the first fruit grain offering to be in the mature and harvestable stage. Much like the lamb needed to be blemish free before being offered as a sacrifice. If the barley fields prove to not be ready for harvest, then the new year begins after the next new moon in the lunar cycle, which would be in 30 days when by that time the grain would be mature enough to harvest and offered to God as an approved first fruit. This is what is meant by the leap year and this is why the fall feasts that we just experienced were actually one new moon cycle too early according to God's calendar and time requirements this time around. It would be like us in the west moving Jan. 1st to Feb. 1st to celebrate the New Year if the grain was still too immature to harvest. It's all about God and His timing that sets the new year calendar that we should be connecting the feast days to. It is impossible to know future year feast dates without knowing the state and condition of the barley fields for harvest in any given year. Although Rosh Hashanah at present is always celebrated on the first of Tishri, there was one time when it moved nine days later to the tenth of the month: That was on a Jubilee year. Leviticus 25:9 says that the Jubilee year was to be announced by the blowing of the shofar on the tenth of Tishri, the Day of Atonement: October 31. On this Jubilee year: both the Day of Atonement (Yom Kippur) and Rosh Hashanah (FoT) are celebrated on the same day (10th of Tishri). The new moon will be spotted in Jerusalem on Saturday, October 21st which means that the first day of Tishri is Sunday, October 22nd and the 10th day of Tishri he would be October 31st. Thus, Sukkot (The Feast of Tabernacles) would run from 14th day to the 22nd day of the Hebrew Month or from November 4th to November 12th on the Gregorian calendar. > Will be the day Obama holds an Inaugural event in Chicago with leaders from all over the world attending. > Marks the time when Jupiter leaves Virgo and is 100 days (Omer Day count) from the solar eclipse (August 21, 2017). Wow, very interesting. Thanks Charlie! Can't help but wonder if "peace and safety" may be a topic of discussion at this strangely-scheduled Obama conference on the 31st( a Tuesday?). Still trying to figure our where the "peace and safety" comes into play on the world scene of events. Maybe it's referring to the signing of the peace deal for Israel that marks the beginning of the 7 years. Anyway, also can't help but wonder of any false signs relating to Fatima's 100 year anniversary and possibly Medjugorje(I think I spelled that correctly).Medjugorje has its followers still waiting for "messages" to be released that were given to children back in the 80's when it happened, I believe. Considering the relevance of the 500th anniversary of the Reformation on October 31st, it seems like a good candidate for something to fool the masses coming from the Vatican that took a heavy blow that day. Daniel Matson's recent release on Watch for the Day has a lot of interesting points. Of course, I hope I'm not actually *here* to see these things take place. Also, anyone notice that Antifa has been organizing(wonder if our notorious Community Organizer could have any involvement) for a November 4th country-wide event? And Obama just so happens to be holding a young leaders summit only days prior. Hmmm, meanwhile Soros just released his billions into his "charity". Interesting indeed. I don't believed Iran or Russia will be involved in leading the Ezekiel 38 attack against Israel. It will be led by Turkey and its AC (Gog and Magog). Iran will likely use its opportunity the next wee while to push for greater control throughout the ME. It was finding out about Iraq easily overtaking Kirkuk that has surprised me. Someone sold them out! Yes, Kirkuk is quite a sad surprise. I was hoping the Kurds would hold it. Gary, good points. We are looking for the fall of Damascus too before the tribulation, correct? I have heard the Christians from those areas above are saying that God has been using ISIS perfectly for His plan. All are in the palm of His Mighty Hand, for His glory. he was out by a couple of days with one of his comments, so is likely correcting it prior to re-posting...I hope. I keep seeing some saying this is a Jubilee year. I really see two things that concern me with that. One is that there is biblical evidence that Jesus would return on a Jubilee as in the second coming. Thus we would not be about to start Tribulation if that is the case but rather we would have just gone through it. The only date we have to go from is 1406 BC which can be found by two separate paths in the Bible. Also, based on biblical evidence as well as from the book of Jubilee the count is 49 years not 50 and if 49 is used it will work from 1406 BC as the date of the Jordan crossover up to 573 BC as the Ezekiel Jubilee as 17 Jubilee cycles. I'm praying that the dates are both a year off because they would put the next (and 120th) Jubilee from creation at 2024. But if the date is right from what "man" has calculated then it's 2023. If it's 2024 then the Trib would need to start very soon like the end of November. This way we account for God keeping His time as stated in the book of Jubilee and with the likelihood of the second coming on a Jubilee. The thing that comforts me is that man has screwed up the keeping of time so bad that we have no clue what day it is much less year. So, 2024 is really possible. 1974 was a significant year for Israel just as much as 1967 was. Same for 1925. There is absolutely no doubt whatsoever jubilee years were the 50th year. Both the 49th and 50th year fields lay fallow. And, more. Zero question it's 50 years. And, there are articles/books/data on the same site to back up the dates. I've dug into some, but I also have a day job so limited in research time. Tis unusual I agree. The Jubilee started in the 50th year, however it was recognised by many rabbis that the 50th year was also year '1' in the start of the new cycle...rabbis used to spend a lot of times debating these finer points. Ben, I reviewed the chart and based on the chart, the to calculate the number of years you use 49 X the number of Jubilees not 50 based on the chart. Its a nice box that someone painted for God and I agree with the concepts but I have looked and looked and there is no proof as to the correct date of the Exodus. Most agree it was 1446 BC not 1437. Appreciate you sending the chart. But I guess we will have to disagree on the accuracy of it because man has unfortunately not kept good records for us to figure out an exact date. One thing I do know, if God's Word tells us he has blinded the Jews of knowing Him and if they also have not kept said jubilee EVER, I sure as the world don't care what a rabbi recognizes. They are clueless. They are God's chosen and they will get a chance to know the truth but as of now ... clueless. US????? You mean because Of Russia.Usa was sending Troops and weapons and Toyotas to Isis.USA did nothing to gain control in syria.